SAN DIEGO, CA – July 22, 2017 – Today, SYFY and IDW Entertainment announced the renewal of the breakout supernatural series WYNONNA EARP for third season, expected to premiere in 2018. 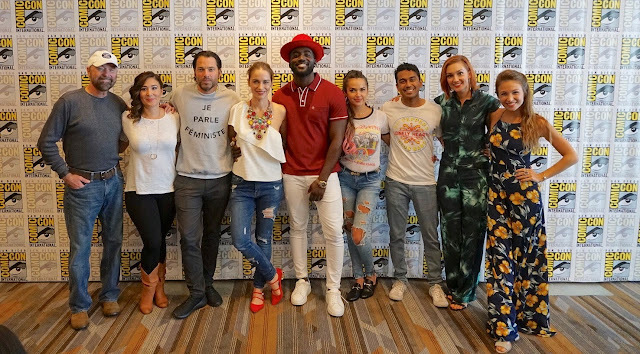 The announcement was made during the show’s panel at San Diego Comic-Con, which was attended by cast members Melanie Scrofano, Shamier Anderson, Tim Rozon, Dominique Provost-Chalkley, Katherine Barrell, Varun Saranga, Tamara Duarte, along with showrunner and creator Emily Andras and comic book creator Beau Smith. Moderated by UPROXX’s Donna Dickens, the cast revealed behind-the-scenes antics and more details about the biggest hidden secret of the season – writing in Melanie Scrofano’s real-life pregnancy, which made Wynonna Earp the first pregnant superhero. Die-hard Earpers got to see an exclusive trailer for the remainder of the season, and were surprised by the Season 3 renewal announcement made on stage by IDW Entertainment President, David Ozer. Produced in Calgary by SEVEN24 Films and globally distributed by IDW Entertainment, WYNONNA EARP follows legendary lawman Wyatt Earp’s descendant, Wynonna (Scrofano) who inherits his mystical gun, Peacemaker. With it, Wynonna and her posse of dysfunctional allies must fight against supernatural beings and other paranormal occurrences in a raucous, whisky-soaked struggle to break her family's demonic curse. Andras (LOST GIRL, KILLJOYS) developed the wildly imaginative series for television and serves as Executive Producer and Showrunner. SEVEN24's Jordy Randall and Tom Cox serve as Executive Producers along with IDW CEO & Publisher Ted Adams and Ozer, as well as Todd Berger and Rick Jacobs. IDW Entertainment was launched in November 2013 to develop, produce and distribute film and television properties based on IDW Publishing’s extensive catalog of comic books and graphic novels. Since that time, the company has successfully debuted two pioneering series – Wynonna Earp, named among the 20 Best New TV Shows of 2016 by Variety, debuted on Syfy in the U.S. and Spike TV in the UK and Australia; and Dirk Gently, based on the best-selling comic novels by Douglas Adams and starring Sam Barnett and Elijah Wood, on BBC America in the U.S. – as both traditional network series and as subscription on-demand content through Netflix. Both series are returning for a second season later in 2017. As a division of IDW Media Holdings, Inc., IDW Entertainment has access to a cache of intellectual properties at the ready for potential development through its sister entity, IDW Publishing, the mega comic book and graphic novel publisher. That connection also provides IDW Entertainment with a wealth of marketing support in terms of advertising and promotion through the various IDW Publishing titles, marketing new series to existing fan bases and through events like ComiCon that appeal to targeted segments of today’s online and cable audiences. Forming strategic creative partnerships with proven authors like Jonathan Kllerman, creator of the best-selling Alex Delaware detective novel series, who is working with IDW Entertainment on developing a series based on the novels called Heartbreak Hotel; Joe Hill, creator of the popular comic book seriesLocke and Key, has written a pilot for the same named series which will have a network pick up announcement shortly; and creative talents like Grey’s Anatomy star Ellen Pompeo, who is collaborating with IDW Entertainment on developing The Devil, a series based on the real-life misdeeds of British gangster Stephen “The Devil” French; IDW Entertainment is forging new models for funding, developing, producing and distributing television content around the globe.